I took a tiny break from projects this weekend to hit a few flea markets. Pickins were a little slim, but I did manage to find a few things. On Saturday I went to the Tigard Flea Market. It's open every weekend, but not every vendor is always there. There always seems to be several covered up tables. I also managed to stop by one garage sale on Saturday as well. Here are my Saturday finds. 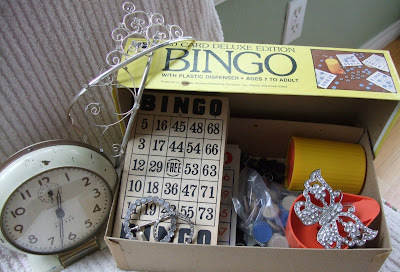 Neat old clock, bingo game with extra cards, two tiaras, rhinestone buckle, rhinestone butterfly belt buckle, and rhinestone pin. On Sunday, Isabel and I went to our favorite monthly flea market located about an hour away. This is what I ended up finding there. Crusty basket, vintage hat stand, hotelware pitcher, bag of buttons, misc. jewelry, pearl bracelet and piece of blue striped ticking fabric. Isabel found the buckle for me. I wouldn't say this was the best thrifting weekend, but definitely some useful stuff. I would like to take this opportunity to acknowledge a couple awards I have received recently. My sweet friend, Sue awarded me with the "Renee Award." 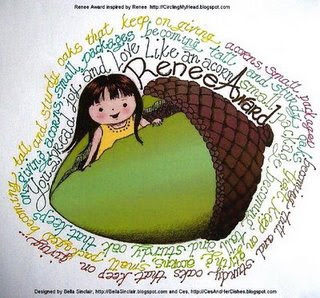 The Renee Award was created in honor of a special person, Renee (who is fighting stage 4 breast cancer) by her friends, Bella and Ces. a difference in the lives of many just by being. tall and sturdy oaks, giving acorns..."
Jeanne from Dream, Create, Inspire recently honored me with the Kreative Blogger award. For this award I'm suppose to list 7 things I love and then pass the award on to 7 people. Here are just 7 of the many things I love. Wow, that was hard just listing 7 things. I could go on and on with the things I love, but I won't. If you are following my blog, you probably already know about all the things I love. 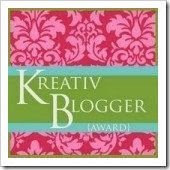 As much as I would love to pass this award on, there are just too many creative bloggers out there to only pick 7. Thank you so much Sue and Jeanne so much for thinking so highly of me to bless me with these awards. I really, really appreciate being recognized in this way. Another busy week ahead. More projects, a trip to Monticello to clean up my booth and a visit from my brother in law who lives in Boise. Never a dull moment around here. Love all the great loot you got this weekend, especially the buttons. Congratulations on your awards and I LOVE furniture with old chippy paint too! Imagine me squeeling with joy, jumping up and down, clapping my hands. I can't wait! I think your weekend finds are lovely. Hmmmm, wondering what you end up doing with the bingo cards. 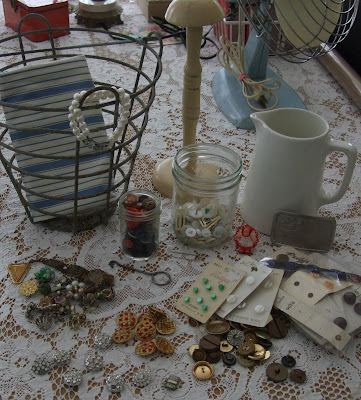 What fun treasures you found! Love it! I'm a huge fan of pink roses. You found some great stuff. Love vintage buttons. Hi there, I am hosting a book swap over on my blog. It is a permanent feature, which will always be on my blog, it is not a one off, like the rose theme swap I'm hosting. I have listed a load of my books which I am willing to swap, take a look, there may be some you fancy. If you would like to list books which you no longer want, and are willing to swap, just contact me at rosehyacinth@hotmail.co.uk, ot leave a comment on my blog, with your name, the name of your blog and the books you wish to swap, and I will type them up and post them on the swap page, so the more adn more people who participate, the wider the range of books there will be to choose from, and remember, it will always be there on my blog.